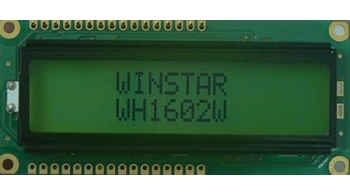 SEA Company offer an incredible discount of 25 % - Character and COG (chip-on-glass) LCD WH1602W-TFK-CT# and WO12864D3-TFK# manufactured by Winstar. WO12864D3-TFK# is used in various fields of science and industry. The main advantages are low power consumption, low operating voltage, good design concept and durability (12-15 years of continuous operation). The basis of the indicator is a liquid crystal matrix, at which applying voltage we can observe a point on the screen. In this character LCD matrix consists of a number of character cells, which are grouped in rows and columns. The character LCD is a type of LCD displays and is used to display information, of the operating device. With character LCD display you can make animation, performing the role of wallpaper when the device is turned on or after accomplish a particular operation. For more information, please, contact the SEA company, the official distributor of Winstar in Ukraine: (044) 291-00-41 or e-mail: info@sea.com.ua (we speak English & Deutsch, Ukrainian & Russian).